Teens from pre-army academy hit by flash flood during trip to southern Israel. Rescue forces located on Thursday night the body of a teenager who was missing following the flash flood in Nahal Tzafit. Magen David Adom paramedics pronounced her dead, bringing the death toll in the disaster to ten. The names of six of victims have been cleared for publication so far: Ela Or from Ma'aleh Adumim, Tzur Alfi from Mazkeret Batya, Shani Shamir from Shoham, Yael Sadan from Jerusalem, Maayan Barhoum from Jerusalem and Romi Cohen from Moshav Maor. The Israeli students were caught in a flash flood while hiking in southern Israel. Several other students were injured. 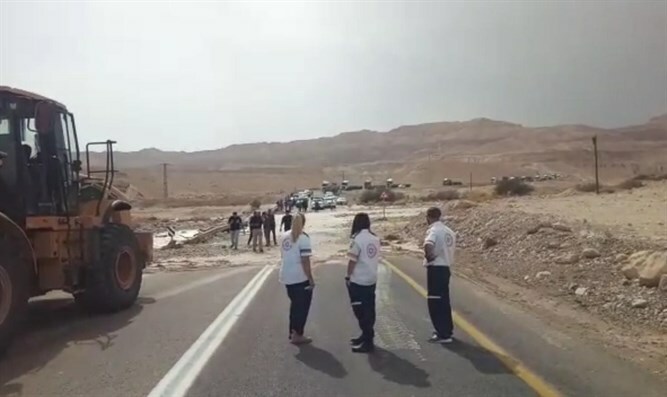 Twenty-fve students from a pre-army preparatory school were hit by the flood while they were hiking in Nahal Tzafit in the Judean Desert west of the Dead Sea. Army prep schools offer Israeli teens graduating from high school the opportunity to spend a year preparing for their mandatory military service. Search and rescue teams, aided by helicopter units, converged on the area, locating 24 of the students. The 669 Search and Rescue unit of the Israeli Air Force was deployed to assist the efforts to locate the missing students. Diving teams were also deployed to aid in the search. All the victims were 18 years old. Sections of Route 90 have been shut down as a result of the flood. Storms hit southern Israel on Thursday, causing flooding in parts of the Negev and the southern port city of Eilat, forcing the temporary closure of a flooded runway at Eilat airport. "On the way to the scene we drove past large puddles and flooding on the road,” said MDA emergency first responder Eitan Shlomo. “With the help of 4 X 4 vehicles we were able to arrive. We joined the MDA crews at the scene next to the entrance to the river and we treated and evacuated 2 17 year olds suffering from injuries to their faces, limbs and heads. They were rescued by IDF airforce helicopters. They were evacuated to Soroka Hospital in light to moderate condition." ZAKA volunteer Yaakov Yifrah described the organization’s efforts to retrieve the bodies of the students killed in the tragic flood.